The conservative Republican maverick opens his latest work with a ""traditional American values"" self-test; readers who score well may be energized by this assertive broadside against all that ails the body politic. As Speaker of the U.S. House of Representatives (1994-1998), Gingrich was the prime mover and shaker behind the 1994 Contract with America that ushered in GOP dominance in Congress. Here, he identifies a quintet of foreign and domestic threats and serves up a new blueprint to help defeat them. On the international front, he says, ""irreconcilable"" Islamic terrorists and rogue dictatorships are eager to secure and use WMD, while China and India endanger our economic might. At home, the ""liberal elite minority is winning"" and the ""conservative majority"" is losing, resulting in godlessness in the public arena, the erosion of patriotism and out-of-control benefit programs that will ""collapse the system."" 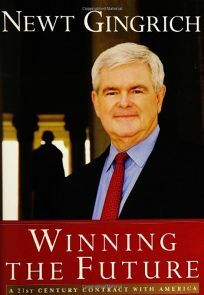 To preserve ""the core values of the American people,"" Gingrich supports a number of fixes, including adapting Cold War strategies to the war on terror, recasting education and immigration in patriotic guises and forging ahead with private investment and health savings accounts. Interspersed with these well-worn arguments are notions about God, country and public life that are long on invective and short on detail. Will legislating the centrality of ""our Creator"" in defining American rights improve jurisprudence? Will establishing a federal and state ""program office in patriotic education"" cure under-performing school systems? Gingrich never manages to link his ambitious project to a cogent critique of the left, resorting instead to predictable jabs at the usual suspects: liberal journalists and academics, Bill Clinton and the Democrats, France and the United Nations. Combine this volatile melange of ideas with chapter-ending plugs for his Web site, mass distribution plans for ""The Contract"" and ""A Walking Tour of God in Washington, D.C.,"" and some readers might be forgiven for suspecting that Gingrich wants to win something more tangible than the future.